"It's that time of year, when the world falls in love!" What a great way to create a gift that can actually hold another gift! 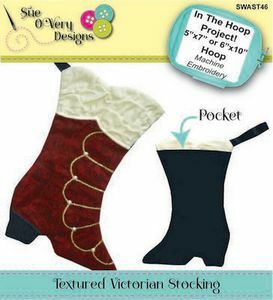 The Textured Victorian Stocking has all sorts of fantastic embroidery techniques that will make a beautiful treasure for memories to last a lifetime. Learn these different techniques: How to create 3D fabric texture, Fabric appliqué, Metallic threads, Hot fix pearls. Final Dimensions: 5" wide x 6 1/2" tall.